Strengthening, clearing and liberating. Sweet basil is a versatile essential oil, with an outstanding array of proven therapeutic benefits that have truly stood the test of time. Basil is a powerful aromatic tonic that brings strength of mind and clarity to those who have pushed themselves too far and become exhausted physically or mentally, or are suffering from stress, lethargy or lack of focus. 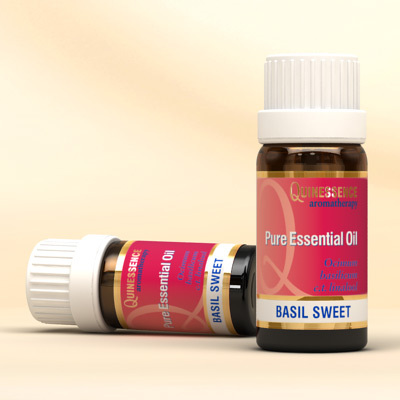 Sweet Basil essential oil has a softer, less aniseed-like aroma which is far more interesting and pleasant than the coarser 'exotic' methyl chavicol chemotype basil oil. Sweet Basil has a more fresh, sweet, herbaceous and slightly spicy aroma with a warm and balsamic background note that clears the head and helps to give the mind strength and clarity. Inhale or vaporise Sweet Basil essential oil to maintain easy breathing and clear sinuses.